Tree to Tree Adventure Park opened in May and is located within Farragut State Park. 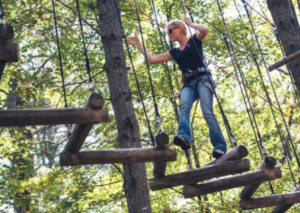 Tree to Tree features several ropes, bridge, and zip line courses ranging from a handful of feet above ground to 65 feet in some sections. The installation features four adult courses and two children’s courses. Each course has at least 12 obstacles, including swinging logs and a zip line reaching heights of up to 70 feet. Each course is estimated to take approximately 25 minutes to finish.